May 2, 2016 – Astronomers using the TRAPPIST telescope at ESO’s La Silla Observatory have discovered three planets with sizes and temperatures similar to those of Venus and Earth, orbiting an ultra-cool dwarf star just 40 light-years from Earth. A team of astronomers led by Michaël Gillon, of the Institut d’Astrophysique et Géophysique at the University of Liège in Belgium, have used the TRAPPIST telescope to observe the star 2MASS J23062928-0502285, now also known as TRAPPIST-1. They found that this dim and cool star faded slightly at regular intervals, indicating that several objects were passing between the star and the Earth. 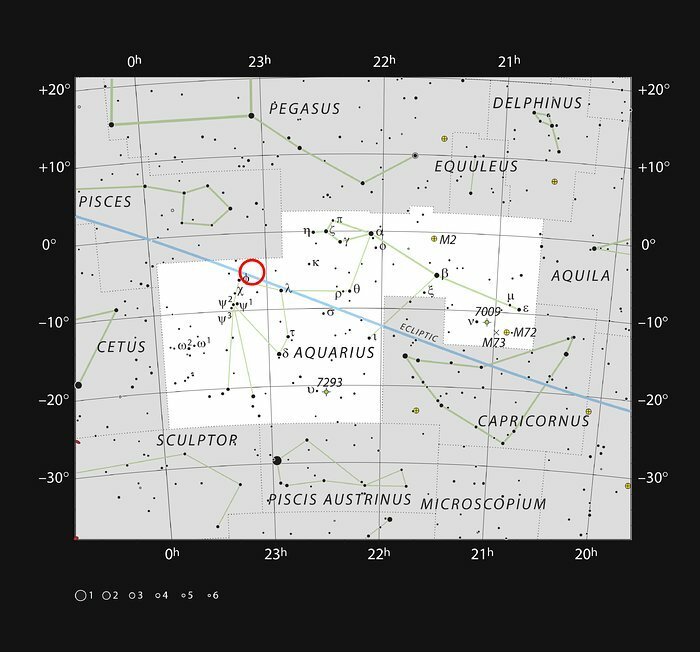 Detailed analysis showed that three planets are present around the star. “With such short orbital periods, the planets are between 20 and 100 times closer to their star than the Earth to the Sun. The structure of this planetary system is much more similar in scale to the system of Jupiter’s moons than to that of the Solar System,” explains Gillon, lead author of the paper. Although they orbit very close to their host dwarf star, the inner two planets only receive four times and twice, respectively, the amount of radiation received by the Earth, because their star is much fainter than the Sun. That puts them closer to the star than the habitable zone for this system, although it is still possible that they possess habitable regions on their surfaces. The third, outer, planet’s orbit is not yet well known, but it probably receives less radiation than the Earth does, but maybe still enough to lie within the habitable zone. The new results will be published in the journal Nature on May 2, 2016. NASA’s Hubble Space Telescope and K2, the Kepler spacecraft’s second mission, will be observing TRAPPIST-1 and its planets later this year. K2 will observe tens of transits of the two close-in Earth-sized exoplanets during the approximately 80-day campaign. The continuous and multiple observations will allow for measurements of predicted transit timing variations – the gravitational interaction between planets that cause transits to occur slightly earlier or slightly later than predicted. This will provide estimates of the masses of these exoplanets. 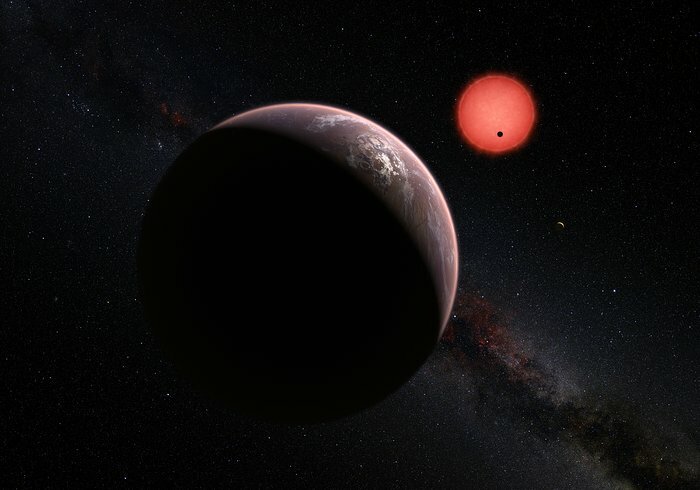 Using K2’s mass measurements and TRAPPIST’s ground-based size measurements, astronomers can calculate or constrain the density of the exoplanets to determine if they could be rocky worlds. “Thanks to several giant telescopes currently under construction, including ESO’s E-ELT and the NASA/ESA/CSA James Webb Space Telescope due to launch for 2018, we will soon be able to study the atmospheric composition of these planets and to explore them first for water, then for traces of biological activity. That’s a giant step in the search for life in the Universe,” says Julien de Wit, a co-author from the Massachusetts Institute of Technology (MIT) in the USA. TRAPPIST (TRAnsiting Planets and PlanetesImals Small Telescope) is a 60-centimeter telescope operated by the University of Liège, based in Chile. TRAPPIST is designed to focus on 60 nearby dwarf stars — very small, cool stars that are so faint they are invisible to optical telescopes. 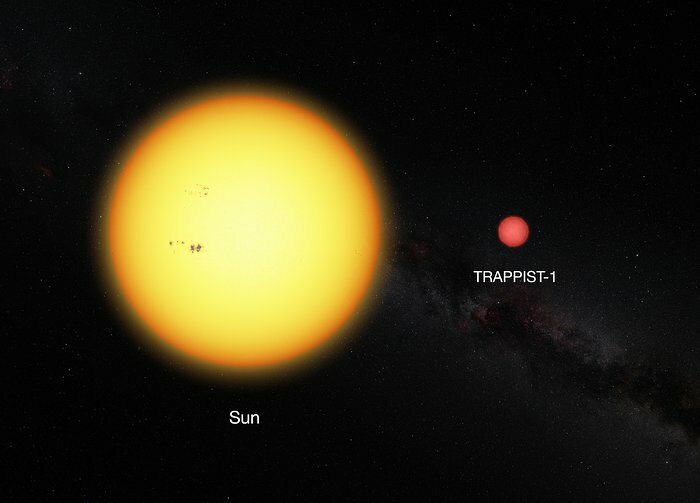 Belgian scientists designed TRAPPIST to monitor dwarf stars at infrared wavelengths and search for planets around them.